Rob Cuda threw for 242 yards and three touchdowns in the season opening victory. 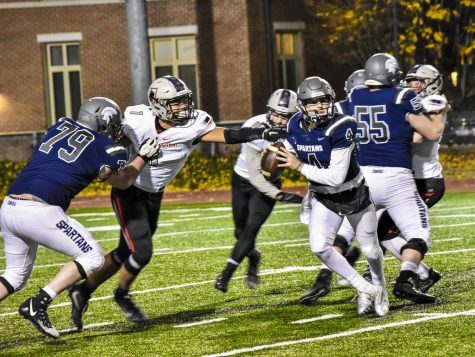 With under five minutes to play in the first quarter, it looked like the Case Western Reserve University football team would not have the dream season they were hoping for. The Spartans were already down 14-0 to the University of Chicago and all three units were struggling. But after the Maroons’ second touchdown, Chicago never scored another point as the Spartans defense righted the ship. The CWRU offense found its groove as well, en route to 34 unanswered points and a 34-14 victory in the opening game of the season. Leading the Spartans offensively was third-year wide receiver Justin Phan. The wideout tied a school record with 15 receptions in the game, cementing his place as fourth-year quarterback Rob Cuda’s favorite target. 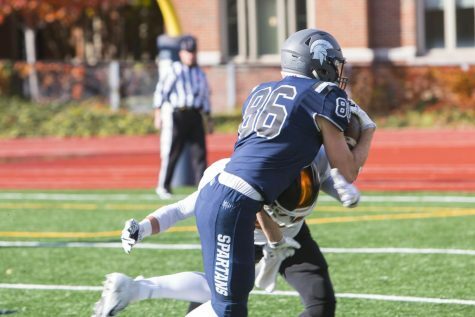 Phan totaled 112 receiving yards and snagged two balls in the end zone for Spartan touchdowns. The speedy wideout also returned a punt 52 yards, almost adding another score to his record breaking day. Phan’s second touchdown tied the game late in the third quarter. Just 15 seconds later, second-year cornerback Kevin Chrissis returned an interception 29 yards for a touchdown. It was Chrissis’ first career interception and first score. The Spartan defense buckled down in the second half, Chicago managed just 46 yards of offense and committed two turnovers after halftime. Fourth-year linebacker Justin McMahon secured eight tackles for the defense, leading the way. Often causing trouble in the Chicago backfield, fourth-year defensive end Dan Techman also registered eight tackles. The Spartans moved the ball effectively in the second half, not having to punt until there were six minutes left in the game. Their first score of the half, the second of Phan’s receptions, came at the end of an eight play, 74 yard drive. Fourth-year running back Jacob Burke plunged ahead from the one yard line for a touchdown to cap off an 11 play, 65 yard drive, giving the Spartans a two score lead, early in the fourth quarter. Cuda led the unit down the field as the Maroons proved no match for the methodical movement of the Spartans. Chicago seemed to always be playing on its heels and CWRU took advantage of it. The Spartans’ final score came on a perfect pass from Cuda to fourth-year wide receiver Zak Hurd in the back of the endzone. With the way CWRU was playing on defense, the 20 point lead with about 11 minutes left in the game felt hard to overcome. Cuda finished the day with 242 yards through the air and a completion percentage of 63.4. The game marked the final meeting between the two rivals for the foreseeable future, with the Spartans victory tying the all-time series at 14. Chicago switched from the University Athletic Association to the Midwest Conference starting with the 2017 season. Following a bye week, the Spartans return home to face Grove City College at DiSanto Field on Saturday, Sept. 16. 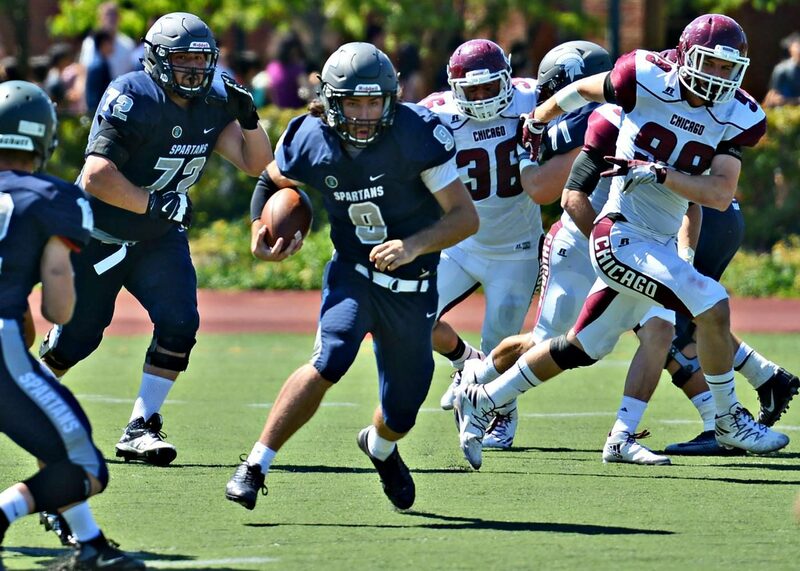 It will be the first matchup in Presidents’ Athletic Conference play for CWRU. 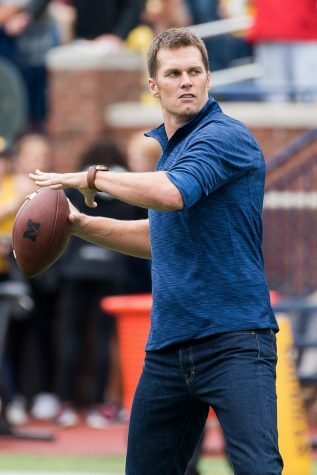 The Wolverines have lost 31 consecutive games, with their last victory occurring in November 2013, and were crushed by the Spartans 55-0 last season. Expect a similar outcome if you plan on attending this year’s game.